Teaming up to tackle housework can build couple unity. For parents Hadley (right) and Luke Howard, the most important work is raising a happy family that is willing to serve, so who does which household task is irrelevant. Photo by Bradley Slade. When Jaydee Burns was growing up, his parents taught him there are no boy jobs or girl jobs but rather just jobs that get completed fastest when everyone helps each other. He and his wife, Shaunda Price Burns (’96), have carried that same approach into their own family during their 21 years of marriage and as they’ve raised six children, ages 8 to 18. The Burnses have created an unusually equitable division of labor. BYU sociology professor Renata Tonks Forste (BS ’84, MS ’86) says their style fits well with her research that found family satisfaction is higher when both partners contribute to decision making and housework. Along with graduate student Kiira E. Fox (BS ’10, MS ’11), she conducted a study about the division of household labor among married or cohabiting couples in 31 countries. “Spouses are more satisfied when neither one is solely responsible for any given household task,” says Forste. Throughout the countries Forste studied, women spend significantly more hours than men in combined time of working outside the home and inside it. Their unpaid household work, though, is often not seen as “real” work by society. “It’s done in the privacy of the home, not in public, and therefore can become invisible,” says Forste. She believes couples build happier marriages and stronger families when they understand how housework got divided in the first place, value household labor as important for all family members, let go of rigid stereotypes about who should do what, and intentionally create a housework plan that works for both spouses. Forste says the contemporary gendered division of household labor is a relatively recent development. Before the industrial revolution became widespread in the mid-19th century, all societies were agriculturally based and both husbands and wives produced goods at home. With the advent of factory work, most men left their home-based work to labor for cash. By the 1950s a typical middle-class family had a male breadwinner with a job that could support the family on one income, leaving women at home and responsible for the lion’s share of both childcare and household work. But beginning in the 1960s, as high-paying manufacturing jobs left the United States or became automated and men’s wages began to decline, more and more women joined the workforce. By 2015, just one quarter of all two-parent households had a father working full-time and a mother staying home. In nearly half of these households, both parents were working full-time. Studies of marital satisfaction consistently show that men are happier with family life than women, perhaps partly because women take on so much more household work. But Forste found in her study that satisfaction is highest for both spouses when men are involved in both childcare and household chores. While men in general could contribute more in the housework arena, Forste believes women could be more willing to let them. “They can’t be gatekeepers. They have to be willing to give up those responsibilities and maybe have a somewhat different standard of cleanliness,” she says. As a culture in general, she thinks Latter-day Saints judge one another—targeting mostly women—too often about things like home cleanliness and a family’s dress and grooming. What Is a Fair Division? Even after an arrangement is agreed on—or evolves naturally—couples can be flexible and help one another as needed. Hadley Howard says that when work is piling up for her husband, Luke, she asks him what she can do to alleviate his burdens. 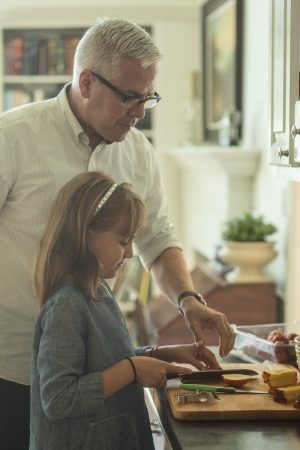 “He does most of the cooking, so I’ll say, ‘Can I pick up dinner duty today?’ Or, ‘Let’s make vacuuming optional this week.’ I just pick up a little slack for him. He does the same for me as needed,” says Hadley. Sue Bergin is an adjunct instructor in the Marriott School. Mothers share how they apply at home what they learned at BYU. After suffering an aneurysm, Katy and her husband had to adjust their expectations for themselves and their children.